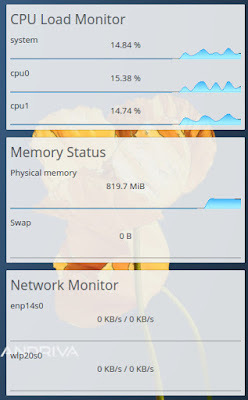 The initial menu of OpenMandriva Lx 3.0 gives you a choice of running it in Live mode, going into the installation, troubleshoot, boot from HDD, verify the image, or shutdown the computer. You can also edit the boot parameters with the function keys. I obviously went for the Live run, and soon a series of other questions followed. They will not be a surprise to anyone who ever tried any Mandriva or its fork version: location, local time, keyboard layout etc. After that, you have to wait for some time until the default desktop appears. If you think that Lx in the OpenMandriva Lx 3.0 name means "LXDE", you need to think again. 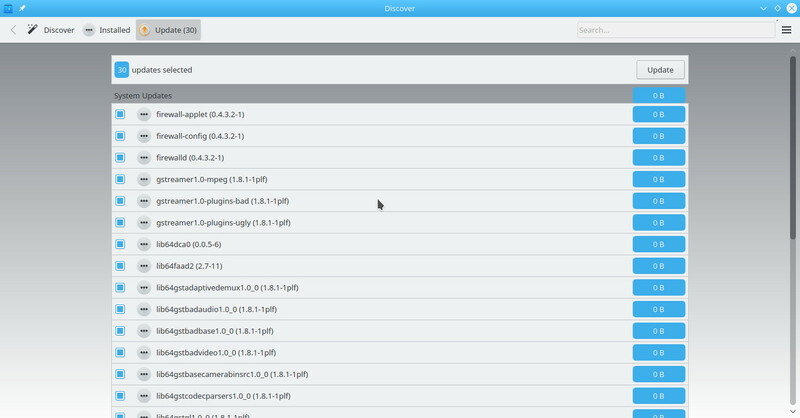 This distribution uses a KDE desktop environment, to be precise Plasma with KDE Framework 5.24. Once booted, you are presented with a default desktop. 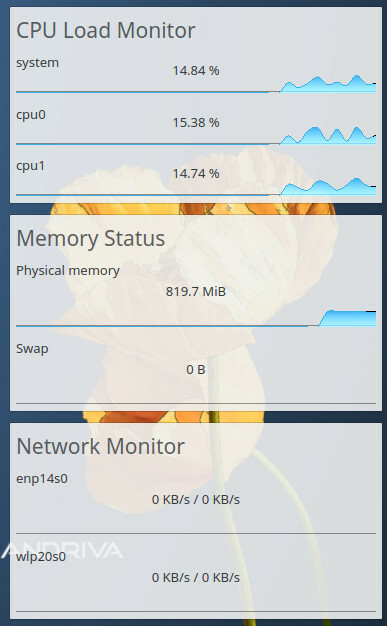 It has a blue wallpaper with OpenMandriva logo in the bottom-right corner and a Prisma-tised flower just above. There are some alternative images available out of the box, but they mostly feature the same flower image with different resolution. There are 4 icons in the top part of the screen: install, donate, join and welcome, but they are initially hidden by a welcome screen with important information about the distribution. The panel at the bottom of the screen is rather wide. It is because it uses 2 rows of "classic" buttons with window names instead of square-sized buttons with application logos as became fashionable recently. Apart from these buttons, there is a menu button on the left side, and notification area on the right. This notification area is rich in icons. Apart from usual USB, network and volume indicators and clocks, it has clipboard monitor, updates status, wastebin icon, keyboard icon and a switch between 4 virtual desktops. These notification area icons are rather large, which makes little sense next to rather narrow window buttons. I would prefer to have smaller icons in the notification area, but more space for the application buttons themselves. As usual in KDE, you can configure the list of items in the notification area, but I could not find the way to make icons smaller. Once booted, the system took about 820 Mb of memory. To be honest, that amount dropped to about 780 Mb after I closed the welcome window. But even that is quite a lot. OpenMandriva Lx 3.0 recognised and configured the network card of the laptop, Realtek 8191 SEvB without a problem. I selected the wireless network from the list and then answered a series of questions about security. Nothing new for KDE users here. The network I used did not require a password, because I wrote this review while in a hotel. Instead, I had to run authorisation in the browser. As a consequence of being away from home, I did not test the network drive connectivity this time. The keyboard icon in the notification area is for virtual keyboard only. You can toggle the on-screen keyboard by right-clicking that item. There is also a choice between different layouts, including English, Russian and a half-dozen other languages. However, this virtual keyboard is useless - it does not transfer anything to the text window you want to type in. Also useless is the Settings item in the right-click menu of that icon. It means that the whole concept of including that icon in the notification area is more than questionable. However, if you want to configure your keyboard layout or add another one, you can follow the guide, which is still applicable to OpenMandriva 3.0. The only thing I'd like to mention here is that the configuration window is so wrongly sized that you have to use half a dozen scroll bars to get to the list of active layouts. This is nothing new for KDE users since version 3.0, but it has not been looked at. Unfortunately, even after configuring English UK + Russian layouts I was not able to type in Russian. Neither my hotkey nor mouse clicks allowed me to switch to a Russian layout. OpenMandriva Lx 3.0 comes with necessary codecs and plugins to watch multimedia on your computer. VLC gives you a no-brainer solution for playback of any file from the local storage. Firefox was able to play videos from YouTube and Vimeo without any question. 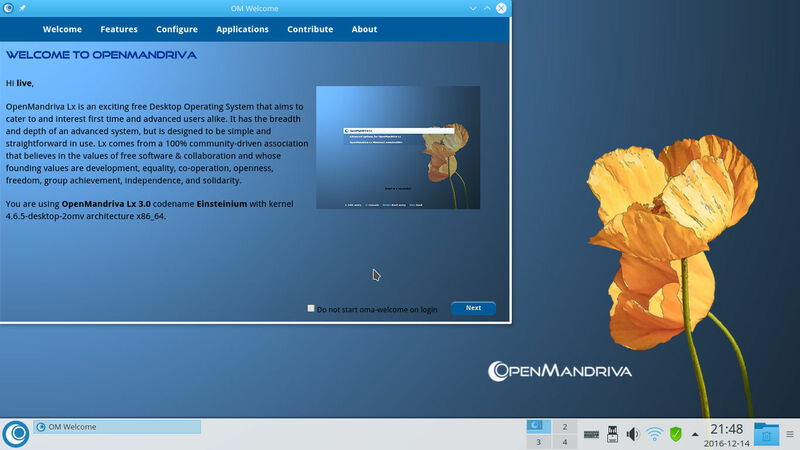 OpenMandriva Lx 3.0 comes well-equipped with applications for any taste and need. 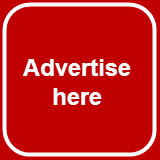 Firefox 48.0 and QupZilla are the browsers available out of the box. There are also a dozen other Internet tools: KDE blogging client, KTorrent, KMail, Akgregator, Kopete, Cloud storage manager and so on. Graphics tools in OpenMandriva 3.0 include Gwenview image viewer, Okular document viewer, Scanlite and XSane scanning utilites, Krita editor and some more. LibreOffice 5.2.0.4 represents the productivity tools in OpenMandriva Lx along with Scroodge money manager, Kontact, KOrganizer, KAddressBook and so on. VLC, Clementine, SMPlayer, mpv video player, Plasma media center: the list of players available immediately in OpenMandriva Lx 3.0 is huge. There are also Kdenlive video editor, KWave sound editor and some other tools in the Sound&Video menu section. K3B burning utility is also available, but it is in the Tools menu area. I will not list all the applications from the Tools menu section, as the list alone would take half a page. 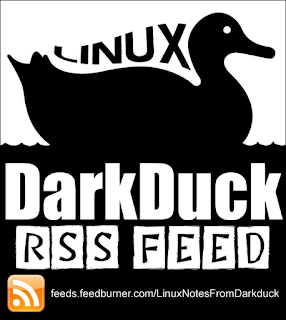 What is worth mentioning, the System tools include an application called ROSA Image Writer, which was developed by a different team for their own ROSA Linux distribution. If you don't like any of the applications or need to install more, OpenMandriva Lx 3.0 gives you Discover Software Center. When you launch it for the first time, it is empty. You need to refresh the repositories. However, I was not able to find the "update repositories" function anywhere in that application. Even though its window showed I had 30 updates, the size of all updates was zero, which gave me a hint that the list of updates was not fresh enough. The general feel of OpenMandriva Lx 3.0 was fast and solid. However, that was only on the surface. As soon as you start to look just a little bit deeper, issues go out here and there. High memory usage, keyboard layout glitch, inadequate size of notification area icons, problems with updates - all of that leave a bad taste after the Live Run of OpenMandriva Lx 3.0. Will it ever gain the popularity its parent had just few years ago? I have a very big doubt. I was not able to install this OpenMandriva normally on LVM volumes. It failed to boot. Eventually I was able to repair this with the rescue option of the Mageia 6 installer. The OpenBox Window Manager leaves much to be desired. The next step will be to try to get the second video card (and monitor) working. Dan, out of interest, where did you take the Mageia 6? It is only Mageia 5.1 available now. I had tried OpenMandriva about a year ago and it failed miserably on my hardware (Lenovo ThinkPad T-420 and T-430 laptops! ), glitchy, freezes, and not as user-friendly as one would think. But its ok, surely for someone else? this is the distro of their dreams! but for me, most KDE inspired / powered distros just seem to want to pack so much into their distros that they overlook the fact that sometimes "simpler" is better! I disagree with you in the aspect that "all-in-one" distros are not only KDE-based. But you're right, whatever the contents of the distro, it should be polished and glitch-free.